After more than thirty years of singing, travelling and collecting songs, Cerys Matthews still finds there's no better way to spend time than singing along in good company. 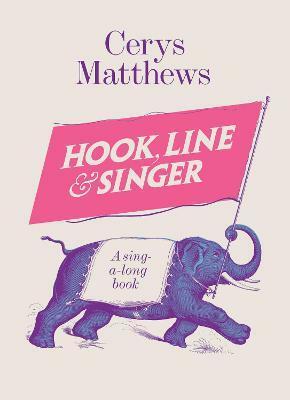 In Hook, Line and Singer she invites you to join her in a grand old singalong. From songs for young families through tunes for vintage-lovers, trips away, American favourites and songs for times of optimism, ending with celebration songs for Christmas and New Year, this is a book filled with Cerys's own memories and musical arrangements. A mix of the traditional and contemporary, Hook, Line and Singer presents music and lyrics clearly so the book can be sung as well as read, offering you the stories behind the songs, their ages and origins, and the reason for their inclusion. This is a life-affirming book of the most memorable, melancholy, silliest and easiest-to-sing songs that Cerys knows, designed to keep handy at home for those moments when only a song will do. Cerys Matthews is a singer, songwriter, author and broadcaster, hosting a popular weekly radio show on BBC6 Music and appearing on The Voice with Tom Jones. A collector of songs for over thirty years, she has also written and presented documentaries on subjects such as Blue Horizon (the iconic British blues label), Sacred Harp singing and Dylan Thomas. A columnist for the number one world music magazineSonglines, she is the author of children's stories Tales from the Deep and Gelert, A Man's Best Friend. She was lead singer and songwriter for the multi-million-selling band Catatonia, and duets with Sir Tom Jones on the perennial winter favourite, 'Baby, It's Cold Outside'. She lives in West London with her children.